Krementz double cufflinks with roaring lions, circa 1900. An updated version of this article can be found in the 1/31/14 post. What the Bachs were to music and the Bernoullis to mathematics, the Krementz family has been to jewelry manufacturing in the United States. When George Krementz founded Krementz & Company in 1866 he began a jewelry dynasty that has touched three centuries. The original firm, its successors and offshoots have been an innovative force in everything from fine to costume jewelry, colored gemstones to rich enamels, cufflinks to stickpins. 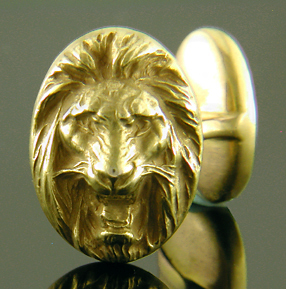 Roaring lion cufflinks, circa 1900. Among the more captivating creations from the firm's long history is a series of "double" cufflinks dating to the years around 1900. Cufflinks with a decorated front, a curved bridge and a small oval back, also known as a "bean back", were common during the late Victorian period and early 1900s. The backs were often left plan or merely engraved with the owner's initials. Krementz added a little pizazz to the bean backs. 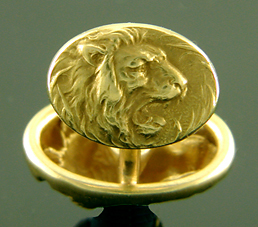 Reverse of roaring lion cufflinks. Around 1900, Krementz began recreating the striking image decorating the fronts of the cufflinks on the smaller bean backs. 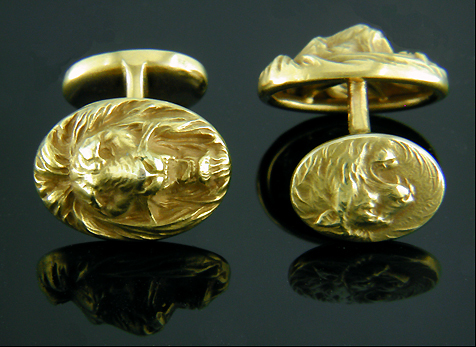 The fierce lion cufflinks pictured above are a wonderful example. From the front a roaring lion stares menacingly. His snarling visage and fierce eyes are framed with a flowing, golden mane. On the back an equally dramatic lion roars, this time in profile. The images of the lions are beautifully sculpted and richly detailed. 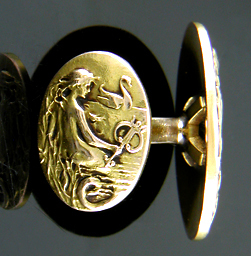 Mermaid and Swan cufflinks, circa 1900. Krementz & Company was one of the first jewelry firms to bring Art Nouveau design to America. Among the firm's work in the emerging style were beautiful flower and foliage brooches colored with shimmering pastel enamels. An example is pictured at the end of this post. Krementz also created cufflinks in the Art Nouveau taste. The above pair features a mermaid with flowing hair, a passing swan and swaying cattails. The mermaid's sceptre is set with a small rose-cut diamond for a magical touch of sparkle. The cufflinks reflect the Art Nouveau fascination with nature and fantasy. On the backs of the cufflinks the mermaid-and-swan scene is faithfully recreated in miniature. The only exception is that the sceptre is now diamond free. Art Nouveau priestess cufflinks, circa 1900. In addition to nature and fantasy, Art Nouveau jewelry designers drew upon ancient and distant cultures to capture a sense of the exotic. This pair of cufflinks features a princess or priestess adorned with an elaborate headdress. The design, possibly inspired by the ancient Egyptian or Mayan civilizations, was largely shaped by the artist's imagination. Classic flowing Art Nouveau curves are evident in the "ribbons" beneath the woman's chin. Front and reverse of Art Nouveau cufflinks. Once again, the striking image of the exotic princess is repeated on the reverse of the cufflinks. Victorian serpent cufflinks, circa 1890. A little earlier than the prior two Art Nouveau pairs, this pair of Krementz cufflinks nicely illustrates the late Victorian love affair with writhing serpents and critter-related jewelry. In this case rattlesnakes are the critters of choice. For the Victorians jewelry often carried symbolic meanings. Intertwined or coiled snakes were a symbol of good fortune and eternity. The vine entwining the snakes appears to be a clematis vine, a Victorian symbol for ingenuity. Front and reverse of serpent and vine cufflinks, circa 1890. Hints of Art Nouveau design can be seen in the sinuous curves of the snakes and vines. The manner in which the scaly, reptilian bodies of the snakes form the borders of the cufflinks also suggest an Art Nouveau influence. 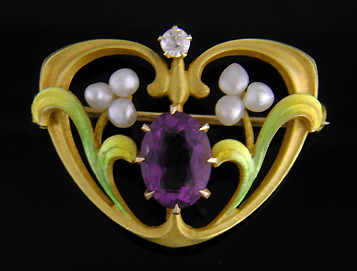 Krementz Art Nouveau brooch, circa 1900. I mentioned earlier that one of the contributions of Krementz & Company to American Art Nouveau design were small flower-inspired brooches colored with shimmering enamels. The above jewel is a wonderful example set pearls, an amethyst and a small sparkling dianond. in the Antique and Estate Jewelry Gallery. The past month has been busy. I have been working with several cufflink collectors off-line and adding a collection of brooches to the Estate Jewelry Gallery. Recent additions to the Antique Cufflink Gallery include a striking pair of Art Nouveau sunflowers crafted by the unidentified "Maltese Cross" maker and an equally dramatic pair of black-and-white cufflinks from the 1930s. Sunflowers Exuberant sunflowers and a tangle of whiplash vines grace these Art Nouveau cufflinks. The dramatic sunflowers and vines are beautifully sculpted in 14kt gold, circa 1900. Black and White Dramatic Art Deco cufflinks with striking black enamel borders and linearly engraved white gold centers. Created by Enos Richardson & Co. in 14kt gold, circa 1930. The fine cufflink makers often featured in these pages created a variety elegant jewels. Below is a trilogy of brooches created by Krementz & Co., Whiteside & Blank and Bippart, Griscom & Osborn in the years around 1900. The same care these jewelers brought to the design and crafting of cufflinks is also seen in these beautiful brooches. Amethyst and Pearls A striking Art Nouveau brooch with pastel enamel leaves, pearl clusters and a small diamond surrounding a regal amethyst. 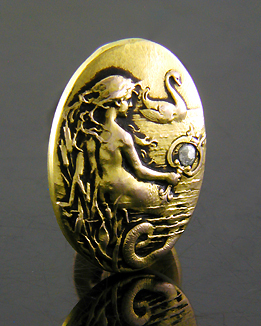 Created by Krementz & Company in 14kt gold, circa 1900. Art Nouveau A beautiful Art Nouveau brooch of intertwined ginkgo leaves surrounding a lavender pastel Amethyst. Created by Whiteside & Blank in 14kt gold, circa 1900. Clover and Pearls A beautifully enameled Victorian lucky clover brooch. The edges of the petals and stem are gold and set with small graduated pearls. Created by Bippart, Griscom & Osborn in 14kt gold, circa 1900.